The Health Care Club (HCC) is the main student-led organization for rounding out health care-related career development, networking and educational opportunities for student members. Participating in club events is a great way to engage with and meet other students (especially 2nd years) and helps 1st years chart out their careers in the health care industry. I had the opportunity to serve club members as one of its Health Care Conference Cabinet Members and greatly enjoyed the experience. I still can't quite figure out what HEAL stands for, but it is a wonderful event where 2nd years organize seminars and introduce the various health care career tracks. Past events included provider, consulting, pharma/biotech, medical device, payer, health IT, and off-campus recruiting. It's great to hear from 2nd years about their recruiting and summer internship experiences in these different MBA functions. While I was interested in pharma/biotech, I still attended the other HEAL sessions and found them to be very informative and helpful to recruiting and understanding how MBAs can impact the industry. 2nd years share their recruiting and summer internship experiences in a structured format. The Health Care Conference is the flagship event of the club. This year, we've invited Jeff Henderson, CFO of Cardinal Health, and Jorge Bartolome, SVP at GSK as keynote speakers. Visit the 2013 conference website here. I've covered this in a separate blog post that I wrote for the official Duke Fuqua MBA blog on the 2013 Health Care Conference here. A half-day event that brought in alumni a few years out of the MBA to discuss their career experiences and offer advice to current MBA students. Alumni from various industries, such as pharma/biotech, consulting, medical device, health IT were separated into different panels throughout the afternoon. It was a great opportunity to hear about the career trajectories of our alumni and offered networking to learn more about the companies as well. HCC leadership works with HSM Faculty Director Prof. David Ridley to host industry leaders to come to Fuqua and engage in lively discussions on the latest trends in the health care field. Thus far, we've had discussions on managed care and the changing health insurance marketplace. The event is quite casual and is structured like a conversation. 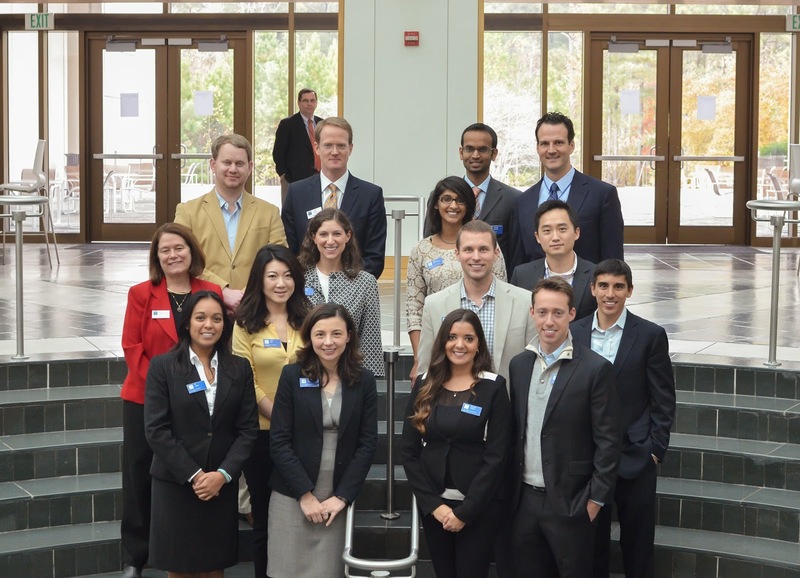 The alumni mentorship program pairs students with Fuqua HSM alums who are 8-10 years post-MBA. Students are matched to mentors based on the future career goals of the student. Our mentors are all in senior positions within our industries of interest, and offer a long-term perspective of what a career can be like post-MBA. It's a great way to get feedback on our assumptions and helps us more accurately define our goals during the program and plan our careers. The club helps host various company events throughout the school year. These can be case discussions with companies, coffee chats, or a visit to companies that are located in the Research Triangle Park. These events are great opportunities to network with companies and learn more about their corporate culture. The HCC organizes various happy hours, parties and networking sessions throughout the year for club members to socialize and get to know each other better. Because of core classes HSM students are separated into sections. These events are a great way for everyone to get back together and catch up on things. It also offers an opportunity for 1st years to connect with 2nd years, who are taking different classes and are on different schedules. Covered in this post of the series. Yet, by settling the stun with an enthusiastic health care methodology, for example, homeopathy, the related health issues are additionally settled. Numerous stores even offer an equivalent day or following day convey administrations if clients will pay a little premium. blog This can spare you from making two excursions to a high road drugs store. There are a handful of unreliable and sometimes even criminal online pharmacies out there, but pharmacy reviews websites normally have a blacklist of rip-off pharmacies to look out for,vardenafil so you can avoid these by checking one of these review websites. Dissimilar to physical medication stores, online drug stores are accessible 24 hours per day, https://www.imedix.com/drugs/erectile-dysfunction/generic-cialis 7 days seven days. You can have your buy whenever of the day, at anytime. Hey guys, I just published this article 15 Powerful Supplements, so wanted to share a short-and sweet version here. Feeling sleep-deprived comes hand in hand with an extensive range of negative side effects. From increased levels of stress and tension to decreased levels of productivity, it’s not uncommon to feel spaced out and disconnected from reality, both from yourself and the people around you, when the first signs of fatigue start to take hold. Fortunately, there is an extensive range of completely natural supplements for fatigue that gives you the opportunity to combat these symptoms and signs of tiredness, enabling you to carry on with your day effectively and productively. These supplements can help to reduce your stress and tension levels while allowing you to complete what you need to get done. Here, we’ll explore some of the most effective fatigue-fighting supplements on the market, giving you the power and edge you need to conquer each day. Fighting the effects of fatigue with supplements is one of the greatest improvements you can make to your everyday life. At its core, you’re simply replacing the vitamins, nutrients, and substances that your body uses up every day but simply don’t have time to replace properly through your lifestyle or diet. Remember to always consult your doctor before administering supplements for their advice and recommendations on dosages. Get ready to live a life where nothing can stand in your way!